A continuation of Zukitwo. Designed to be more flat with less gradients and rounded borders. The Gnome Shell theme, recent commits and installation instructions can be found at github. 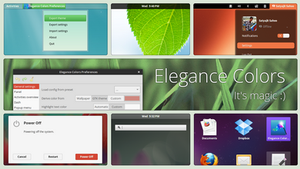 This theme may work in Cinnamon, Budgie and Mate, but those environments aren't supported. Mainly developed for Gnome Shell and XFCE. 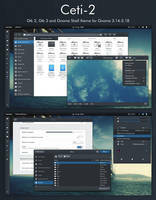 Dash to dock gnome shell extension used for the left bar in preview image. Icons: Numix and Numix Circle. 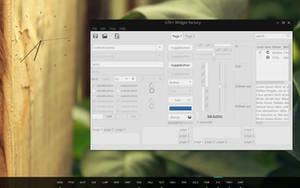 This is one of my favorite theme for Xfce, using it in my Xubuntu desktop for some time now. It really suits my taste. Thank you, keep up the good work. 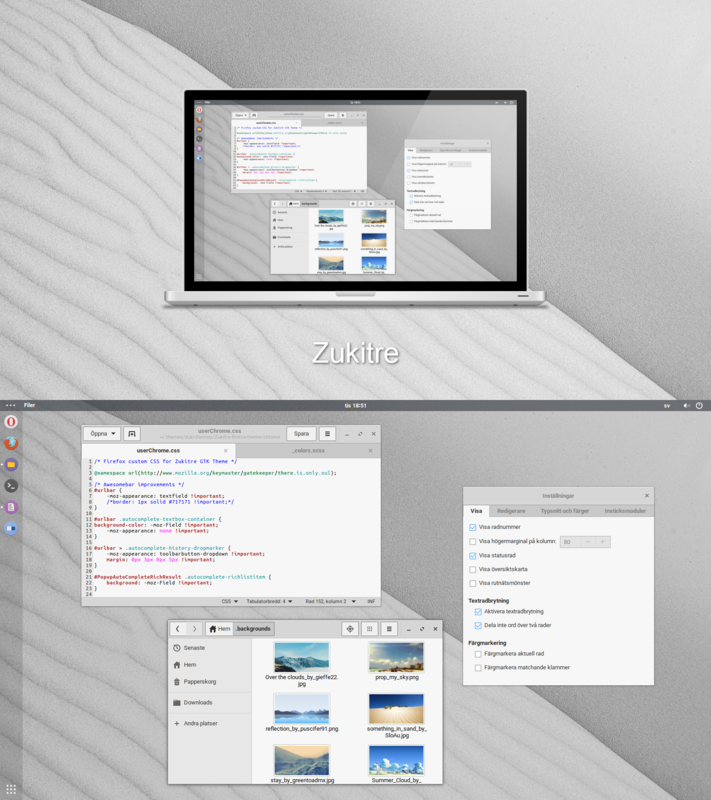 For those of you who don't like the huge Gtk window title bars, go to Zukitre theme folder and open gtk-3.0/gtk-contained.css and search for headerbar.default-decoration and headerbar.default-decoration button.titlebutton (was lines 1569 and 1573 when I was doing this). In these selectors, fiddle with padding and min-heights until you're satisfied. Also try to log off and in again. It looks like it hasn't switched the style entirely and still uses gradients from the previous theme. Check /usr/share/themes and ~/.themes for duplicates. If you have an older version in one folder it may cause issues. Thank you for your answer but I've tried your solution and no one of them fixes the problem. I can't understand what can cause this. P.S. 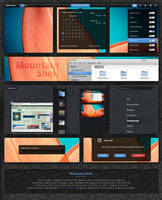 : I like very much your theme, you've done a very great job with that. do you still make windows (10) themes? Oh man, if only this was available for 3.20. Master branch on github is now at version 3.20. Yay, that is fantastic, thanks for that. Too bad you are publishing this right now when Gnome 3.20 has revamped a lot about its themes. Hopefully for the last time. But glad to see you working on your themes again. Thanks! Wanted to push something for 3.18 as it's included in a LTS release. It may also be the main version for Debian Stretch. Going to check how much change there is in 3.20 eventually. Try posting on /r/unixporn if you want some publicity for your themes. OC is usually pretty well received. Hope you have the time to update. Seems the new update also added a few 'cool' things, can't wait to see them in your theme. Excellent theme! I had been looking for an alternative to the excellent Uncomplicated theme, which is no longer being maintained, for a very long time. This theme finally convinced me to make the switch! Your theme has been my favorite for quite a while. I made a vim theme around your GTK theme. They match pretty well. Feel free to have a look I could make something similar for other editors. How can I change the Activities Text for a logo as in the screenshot? In Gnome 3.14 it should change automatically. Beautiful Theme!! I wish I had my Unbuntu installed so I could give this a try. Those are the Unity fallback buttons since this theme isn't made for Unity. I have to say that i love this theme, in my opinion the XFWM theme is much nicer than the Zukitwo theme, but i have a problem: in some apps like OpenOffice or Parole appear some dotted lines in the menu bar and the tools bar, i don't know why they appear, and i'm not a gtk expert, hope you could help me. Some java applications tend to have very bad GTK integration. There's usually nothing I can do to fix it. Oh, well i just downloaded your lastest build and installed it and the dotted lines are now gone. Yum! This is definately going on my Fedora box. Beautiful work, as always. The mix of a flat+square Numix feel, Zuki*'s overall tone, and borderlessness + compact padding is delicious. Add stuff to your DA wishlist! I'll be glad to donate again for your continued work. EDIT: looking at the screenshot I see reusing Adwaita's scrollbars is intended. Okay. Their rounded padded look feel a bit off to me. I don't use Linux much anymore, but my God, I love that dock. I love it so much. Really cool lassekongo83! Your work is good as always! I also like the way the shell looks like. Will convert my desktop soon with the same setup as yours. One thing: could you please provide the fonts(-sizes) you use? Font size is Droid Sans 10. Font rendering patched with infinality. Slight hinting, rgba. Stupid question number 2: where can I find the wallpaper? Stupid question number 3: How to remove the padding from the Dock? lassekongo83 Thank you for the theme ! It is really nicely done ! "A: Open gnome-shell.css search for #dash and uncomment the border area at the bottom." I think you should highlight this into the description as it render the whole theme cleaner in this configuration ! Hmm.. the dock now is expand till the bottom, but not fully to the top. Hmm, going to try with the rending patching. Nice work. 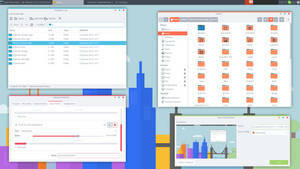 Will this theme work in Ubuntu 14.10? 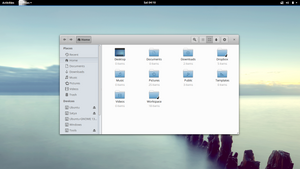 Ubuntu 14.10 uses GTK 3.12 and this theme requires 3.14. There are however some older builds for GTK 3.12 at launchpad, but those aren't updated or fixed any longer. Looks good, using it now. 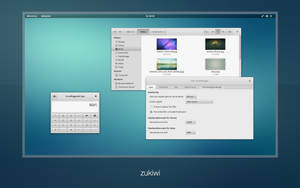 Could you, perhaps, provide a background image for the Xfce panel as you did with Zukitwo? That would be really great. This wasn't designed with a transparent background in mind for Xfce. Looks better without imo. But you can try the same background from Zukitwo.